Since building my first raised garden bed a couple years ago (there’s a second one next to it now), I’ve really enjoyed growing our own veggies. 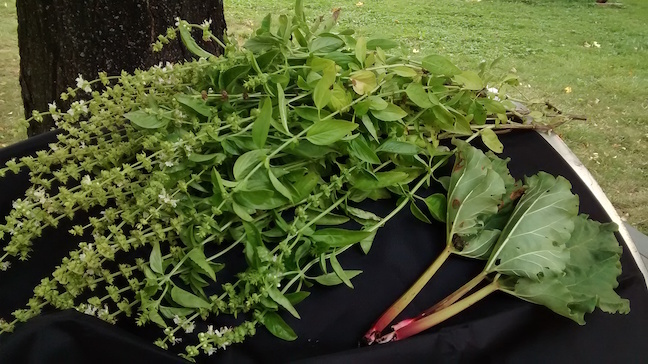 It’s a fun project if you’re into that sorta thing – fairly easy to setup, cathartic in its rhythm (weed, water, harvest, repeat…), and the payoff half-way through summer is a lot of fresh snacks! 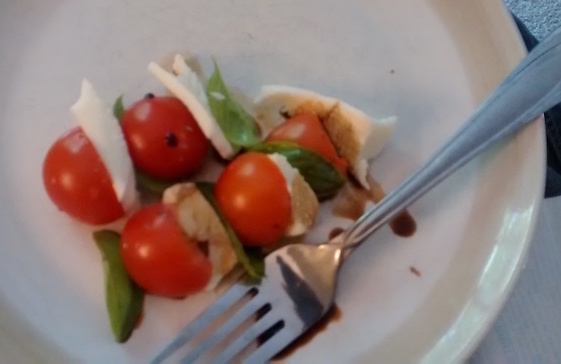 We had lots of caprese salad! It can be a good activity for the whole family too. 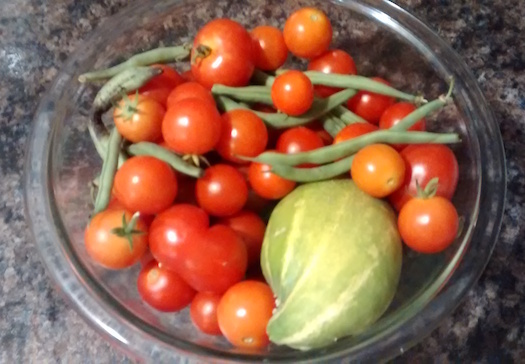 Most of the work is on me, which is fine since I find it relaxing, but last year my 5 yo helped plant seeds, my 10 yo went out with a bowl every few days to check for veggies (she loves them), and they’d all go in there with a watering can from time to time (even though I run a hose out to it). Why Start a Garden Indoors? Plants that don’t grow fast enough yield little (if anything) by the end of the summer. Last year I got a few large tomatoes and one sad pepper that was so bitter I just tossed it. You’ll have better luck buying sprigs, but it can be the difference of $3-5 per plant versus $1.99 for a packet with enough seeds for a couple dozen plants. 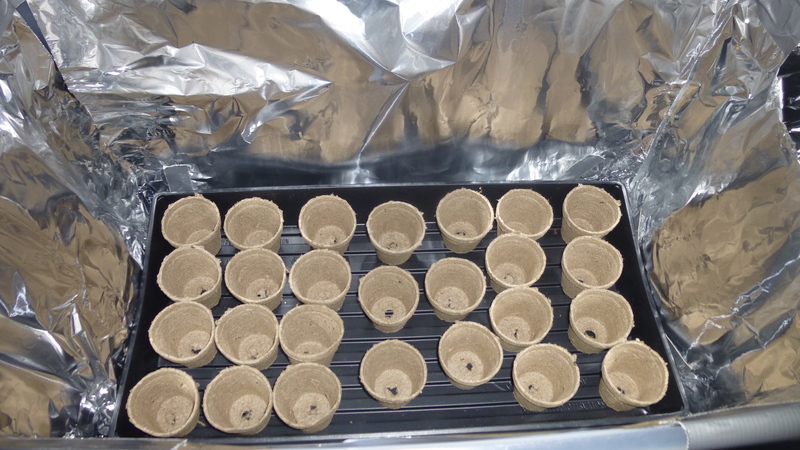 We didn’t have much going on last weekend, so it seemed like a good time to tackle a project I’ve been thinking about – making an indoor “grow box”, which is just a mini ecosystem with good soil and plenty of light, where your plants can germinate for 2 or 3 months before transplanting them outside. You’ll need some basic materials, and there’s a good chance you’ll already have at least a few of these things laying around the house. A sturdy plastic container to keep everything in. It should be rigid enough to move around without flexing too much. 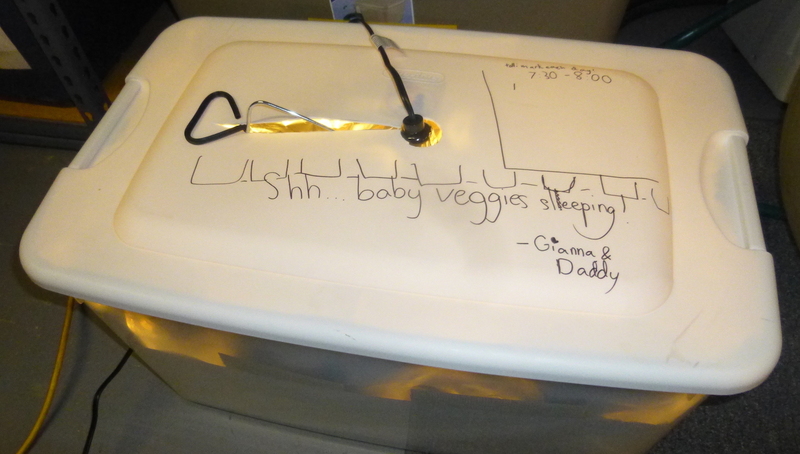 The lid doesn’t have to be too thick, but it needs to support a light clamped onto it. 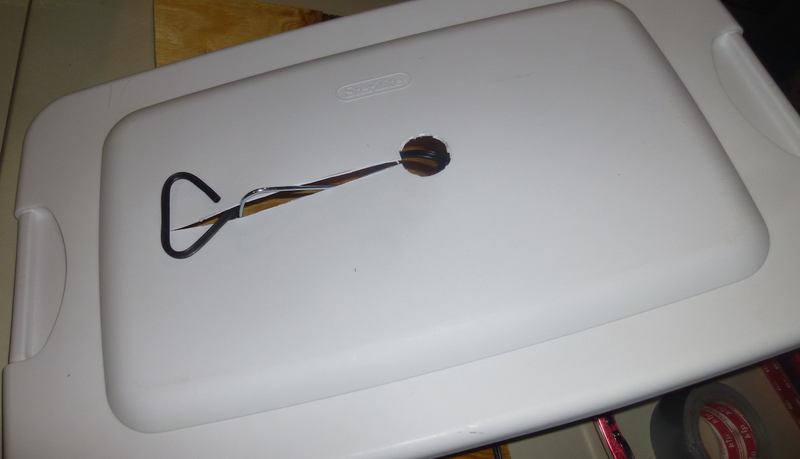 A 60 or 70 quart storage tote will work fine, and you can most likely pick one up for $10. 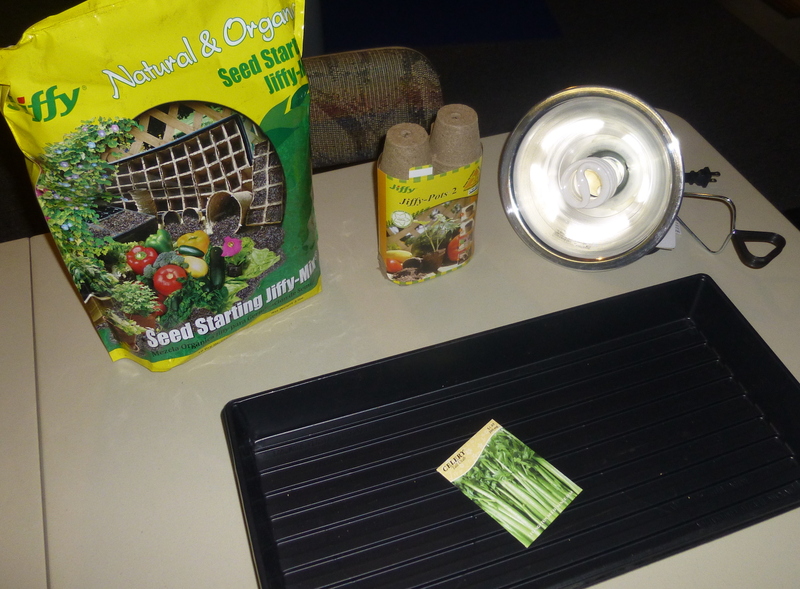 A clamp light and bright bulb to provide light and warmth to the seedlings. I used a fluorescent bulb because it’s warm and bright without getting as hot as an incandescent, plus you’ll be removing the lid a lot and the jostling around is more likely to break the filament in a “normal” bulb. It’s 1600 lumens which is definitely bright, although I saw some upwards of 2500 – 3000 lumens. We’ll see if this one is enough. I picked up the lamp for $10 and a bulb for about $3. Extension Cord, Power Strip and/or Timer? If you have an out-of-the-way place where the plants won’t get bumped, that also has an outlet nearby, that’s perfect. I grabbed a power strip so the kids could easily turn the lamp on and off – once the lamp’s clamped to the lid its switch is awkward to reach. A timer will make it easier to keep the plants lit, but easier to forget about too. Your plants still need to be watered, and not using a timer will make it less likely you’ll forget about the plants for days! Also, I’d like to keep the kids actively involved in the process, and I’m not looking to automate the whole thing. This one’s debatable. The container itself is plastic, so I wasn’t sure whether to use another tray inside that. I found one for about $3 that fit nicely in the container I’d chosen. 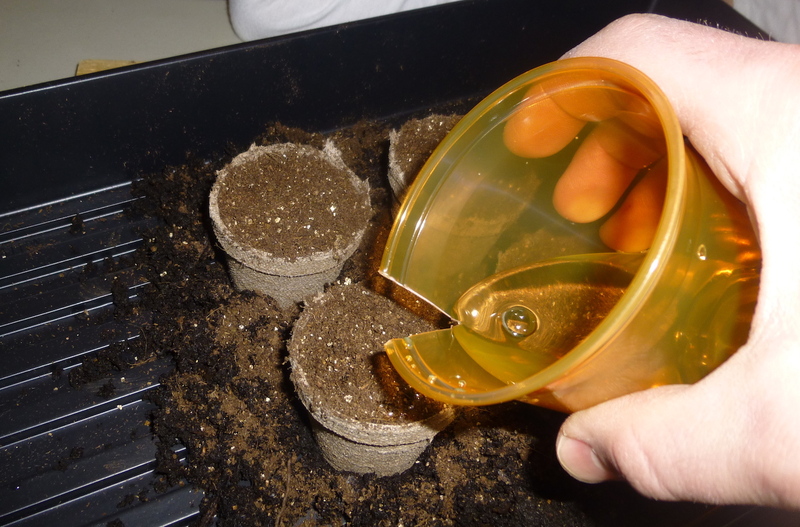 This might make it easier to transplant the plants when the weather gets warmer, as well as remove them if I need to fix the foil or clean the container. 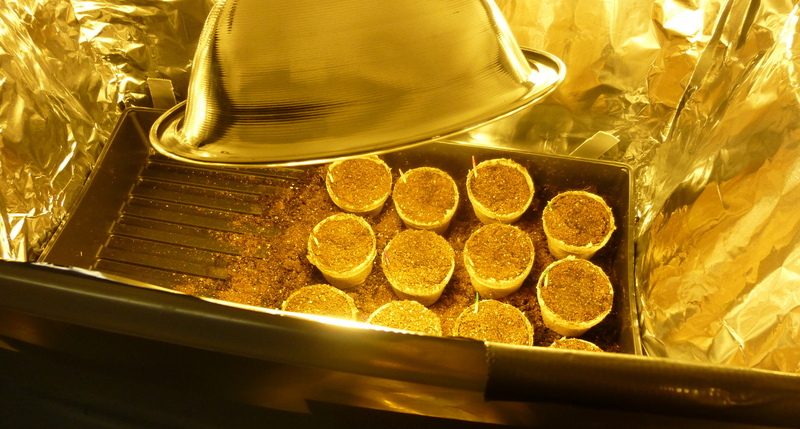 You’ll be covering the inside of the container with foil to maximize the reflection of light to the plants. I used duct tape to secure it. The small pots I picked up are biodegradable, so once the vegetables start growing roots I won’t have to pull them out and risk damaging them. The entire pot can be planted directly in the ground. Which seeds you use depend on what time of year you decide to do this. I’ve got a few months until warm weather so I picked celery and a couple other veggies that need 10-14 weeks indoors before the last frost. $10 – $15 for everything. So how much this project costs depends a lot on what you’ve got laying around – anywhere from $15 to $50. 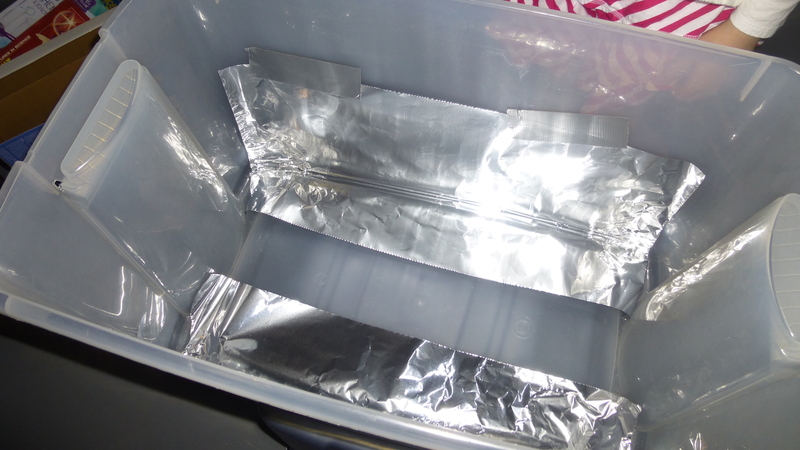 The first thing to do is cover the inside of the plastic container with foil, shiny side facing inwards, and secure it with duct tape. Any kind of tape will do I suppose, but if it gets a little humid inside the box I’m not sure how well scotch tape will hold up in the long run. The idea here is to reflect as much light as possible back on the plants. If you happen to pick up a container that’s completely white you may not need to do this step… but it wouldn’t hurt anyways. You’ll need a place to attach the lamp, and that means cutting a slit in the lid that’s big enough to accommodate the lamp you’ve got. For me, 8″ was enough to allow the lamp through while leaving a place to attach the clamp. 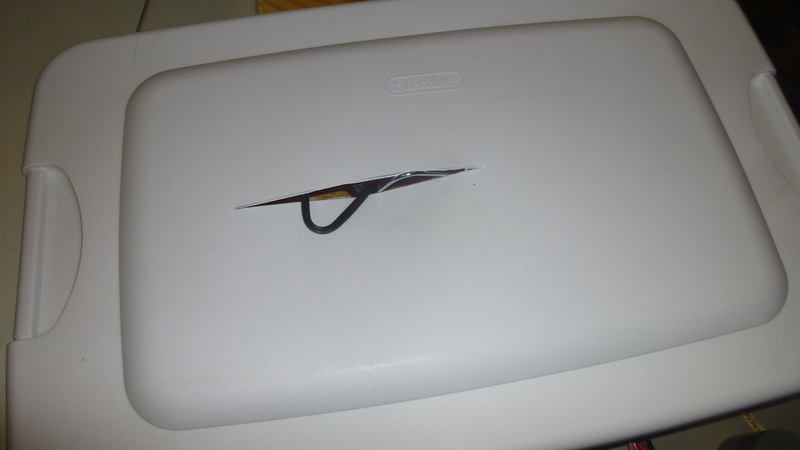 I used a sharp utility knife and a level (to get the line straight), but a good pair of scissors might suffice… the plastic is soft. The hole in the middle is about an inch and a half wide, to allow for the back of the lamp and the switch. 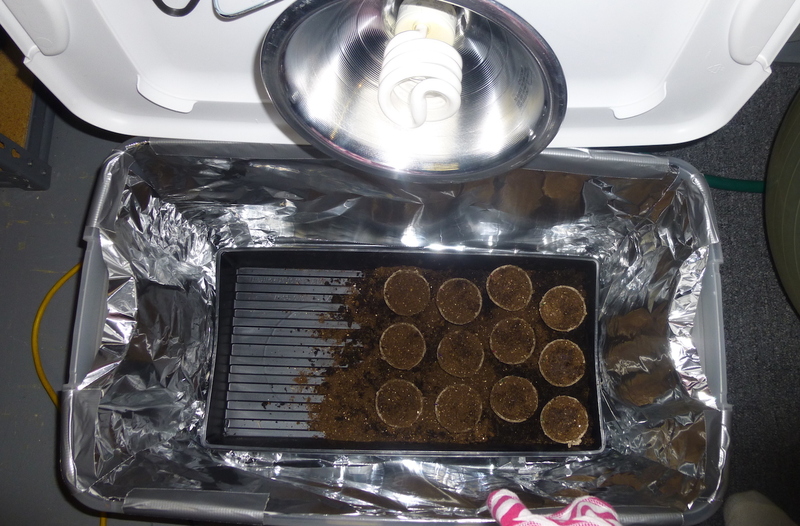 You probably don’t need this at first, as the lamp will be adjusted fairly close to the seeds, but as things grow you’ll need to be able to back the lamp up even to the point that part of it is out through the lid. 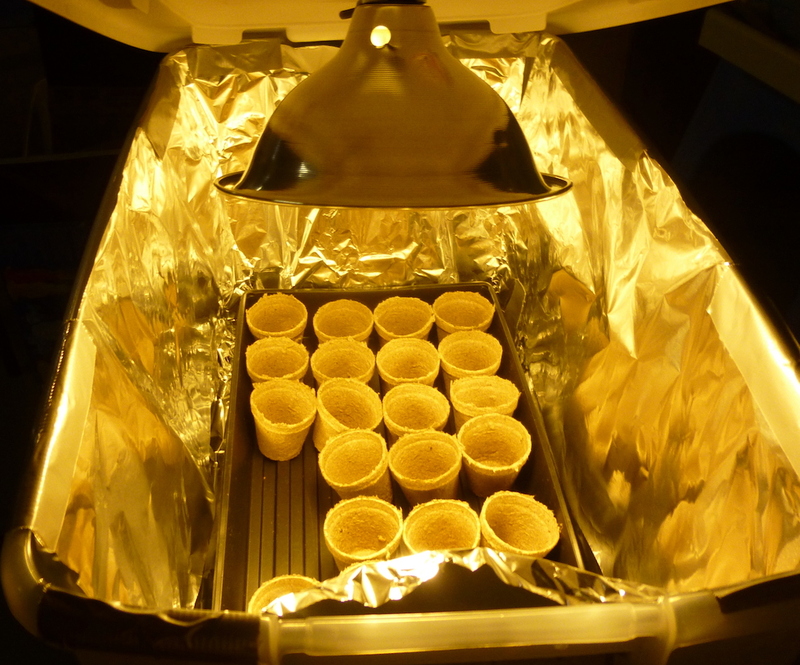 Once attached, adjust the lamp as needed to aim it towards the seeds. Keep it a few inches away and adjust it when things start growing. Finally, planting the seeds. I originally thought we’d just try celery, which recommends about 3 months indoors. 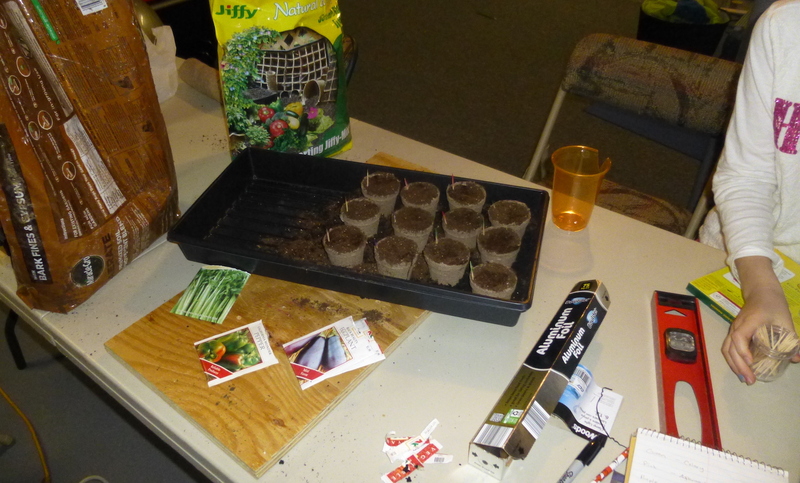 Then I realized I had left-over unopened seeds from last year, and I figured we had nothing to lose. 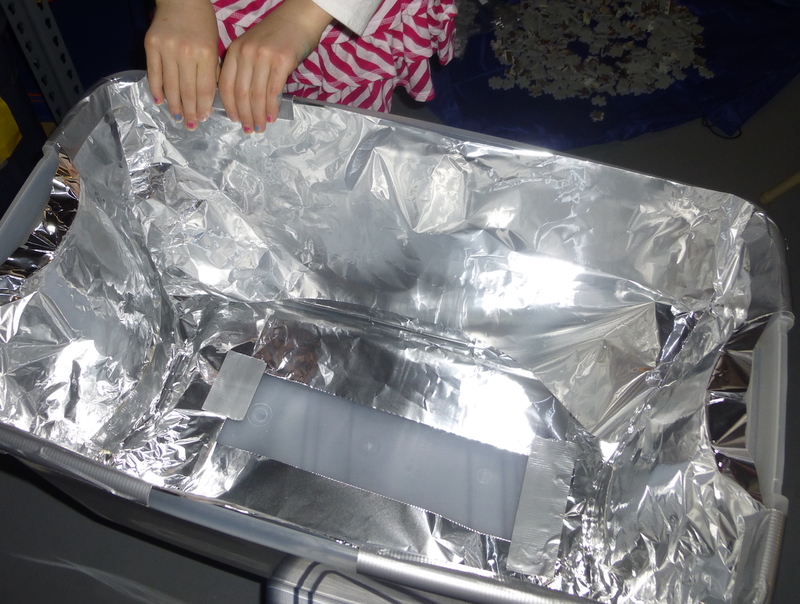 We slid everything to one side, and filled additional cups for eggplants, peppers and asparagus too. My daughter grabbed some toothpicks and markers and colored-coded each pot so we’d remember which was which. Nice! We wrote the name/color pairs down in a notebook. The extra dirt around the cups is just to hold them steady so they don’t tip over if the container gets moved. I think next time I would just get a small bag of pebbles instead, but that’s just for aesthetic reasons.. I think the dirt will be fine. Not much else to do now except maintain it. I considered buying a timer for the light, but I’d like the kids to stay involved with it, and at least now they can go downstairs and turn the lamp on in the morning and off at night. That’ll give us about 12 – 13 hours of direct light, which is more (though not the same intensity or quality) direct light than they ever get outdoors. 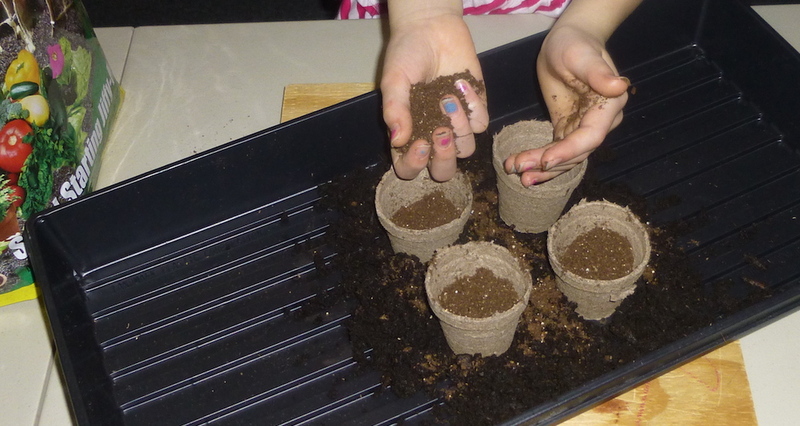 If everything is kept watered and warm, we should start seeing some seedlings sprouting in about 2 – 3 weeks. Will the biodegradable containers dissolve before I can get them outside? After several months of dirt and water will they begin to break down before I can transplant them? I’ve bought tomato sprigs that came in a larger version of these cups, and you could still see them in the garden even in the Fall. So although they’re biodegradable I think it takes quite awhile. Will the 1600 lumens bulb be bright (and warm) enough? I’m hoping it is, but only time will tell. 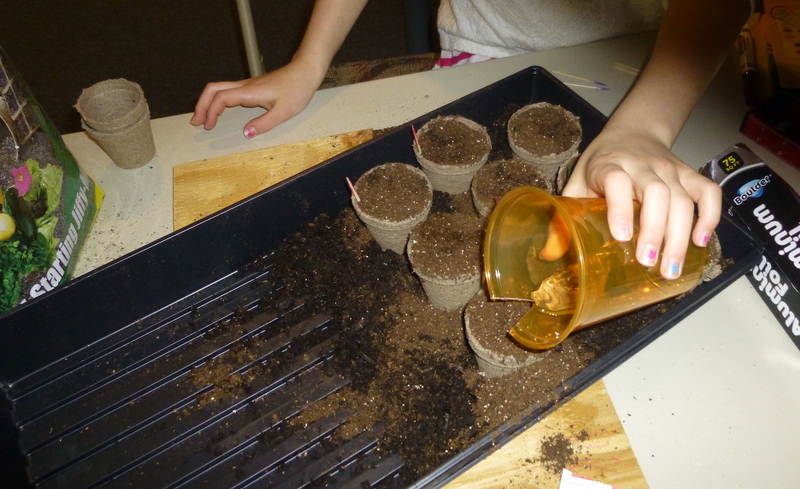 We’ll know once the seedlings appear, if they continue to grow well. Will the plants survive the shock of transplanting them outside? I’m counting chickens before they’ve hatched here, but assuming all goes well there’s a certain “acclimation” process involved to avoid shocking the plants. I don’t know what the effect is on a plant that’s been growing indoors in a controlled environment, that’s suddenly placed outdoors with more variedly shifting temperatures, shifting weather conditions and a radically different light source. If you try it out, let me know how it goes! If you have any suggestions, or try something different that you have great luck with, I’d love to hear that too. I’ll continue to update this post over the next few months, as we start seeing results. Here’s a good video that I watched before setting this up. As you can see, it’s working nicely for him.